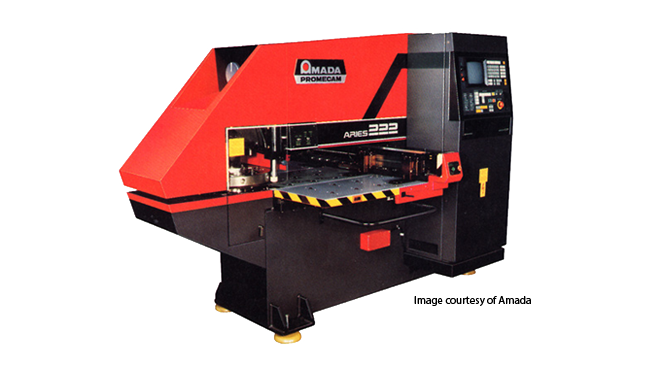 The ARIES turret press series from Amada includes two CNC machines, this one and the ARIES-245. If you need to handle sheet metal with thicknesses up to 4.5mm, the ARIES-222 punch machine is the one for you..
Sheet metal software from Merry Mechanization works great and is an easy choice to use with this sheet metal fabrication machine. It has the ability to do forming applications such as lancing, electrical knockouts, and louvering. This punching machine is built with a dual C-frame which allows one frame to hold the turret and the other frame to hold the press mechanism. Shot pins which are tapered help guarantee alignments for the punch and die, and also allow microjoint techniques to be possible.